Clifford James Geertz ( i/ˈɡɜːrts/; August 23, 1926 – October 30, 2006) was an American anthropologist who is remembered mostly for his strong support for and influence on the practice of symbolic anthropology, and who was considered "for three decades...the single most influential cultural anthropologist in the United States." He served until his death as professor emeritus at the Institute for Advanced Study, Princeton. Geertz was born in San Francisco on August 23, 1926. After service in the US Navy in World War II (1943–45), Geertz received his B.A. in philosophy from Antioch College in 1950. 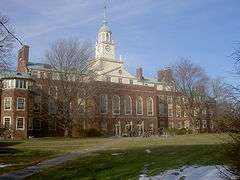 After graduating from Antioch he attended Harvard University from which he graduated in 1956, as a student in the Department of Social Relations. This interdisciplinary program was led by Talcott Parsons, and Geertz worked with both Parsons and Clyde Kluckhohn. Geertz was trained as an anthropologist, and conducted his first long-term fieldwork, together with his wife, Hildred, in Java, which was funded by the Ford Foundation and MIT. He studied the religious life of a small, upcountry town for 2.5 years, living with a railroad labourer's family. After finishing his thesis, Geertz returned to Bali and Sumatra. He earned his Ph.D. in 1956 with a dissertation entitled Religion in Modjukuto: A Study of Ritual Belief In A Complex Society. He was one of the earliest scholars to see that the insights provided by common language, philosophy and literary analysis could have major explanatory force in the social sciences. Geertz aimed to provide the social sciences with an understanding and appreciation of “thick description.” Geertz applied thick description to anthropological studies (specifically his own 'interpretive anthropology'), while producing theory that had implications for other social sciences. For example, Geertz asserted, that culture was essentially semiotic in nature, and this theory has implications for comparative political sciences. In seeking to converse with subjects in foreign cultures and gain access to their conceptual world, this is the goal of the semiotic approach to culture. Cultural theory is not its own master; at the end of the day we must appreciate, that the generality “thick description” contrives to achieve, grows out of the delicacy of its distinctions, not the sweep of its abstraction.> The essential task of theory-building here is not to codify abstract regularities, but to make thick description possible; not to generalize across cases, but to generalize within them. During Geertz's long career he worked through a variety of theoretical phases and schools of thought. In 1957 Geertz wrote that "The drive to make sense out of experience, to give it form and order, is evidently as real and pressing as the more familiar biological needs...", a statement which reflects an early leaning toward functionalism. Despite his discontent with most academic philosophy of his time, Geertz was largely influenced by two philosophers: Gilbert Ryle and Ludwig Wittgenstein. Drawing on the tradition of ordinary language philosophy, he adopted the proposition of thick description from the British philosopher Ryle and imported the concept of family resemblances into anthropology from the post-analytic philosophy of Wittgenstein. He also introduced Alfred Schütz's "...distinctions among predecessors, consociates, contemporaries and successors, distinctions that have become commonplace in anthropology" in his wake. Geertz stressed how the links between "consociate-contemporary-predecessor-successor...[derive from] the umwelt-mitwelt-vorwelt-vogelwelt formulation" of Schütz's phenomenology. Geertz's research and ideas had a strong influence on 20th century academia. His findings reverberate within modern anthropology and communication studies. Aside from his influence on anthropology, Geertz' landmark contributions to social and cultural theory were also influential for geographers, ecologists, political scientists, scholars of religion, historians, and other humanists. University of Miami Professor Daniel Pals wrote of Geertz in 1996, "His critics are few; his admirers legion." Talal Asad attacked the dualism in Geertzian theory: the theory does not provide a bridge between external symbols and internal dispositions. He also pointed out the need for a more nuanced approach toward the historical background of certain concepts. Criticizing Geertz's theory of religion in general he pointed out a gap between 'cultural system' and 'social reality' when attempting to define the concept of religion in universal terms. ↑ "Anthropologist Biographies - Geertz". Indiana.edu. 1926-08-23. Retrieved 2012-08-13. ↑ Gilbert Ryle, "The Thinking of Thoughts: What is 'Le Penseur' Doing?" Reprinted from 'University Lectures', no.18, 1968, by permission of the University of Saskatchewan. 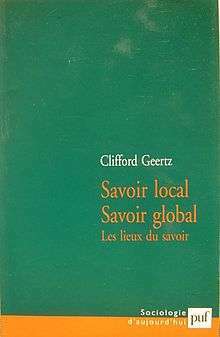 ↑ "Clifford Geertz 1926 - 2006". Princeton, New Jersey: Institute for Advanced Study Press. 2006. ↑ Frankenberry, Nancy K.; Hans H. Penner (1999). 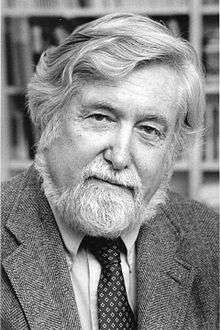 "Clifford Geertz's Long-Lasting Moods, Motivations, and Metaphysical Conceptions". 79. Upper Saddle River, New Jersey: The University of Chicago Press: 617–640. ISBN 0-13-158591-6. JSTOR 1206117. 1 2 Asad, Talal (1983). Anthropological Concepts of Religion: Reflections on Geertz. Man (N.S.) 18:237-59.